Photo: We kind of like Winner just because of the name. 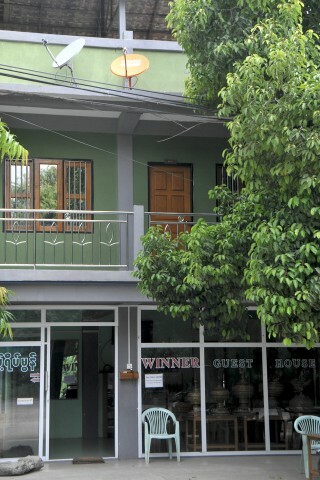 Winner Guesthouse’s marketing tactic is simple: They offer some of the cheapest rooms around, and they throw in breakfast. Found in the Wet Kyi Inn accommodation strip, they don’t manage to undercut Pann Cherry they do go a step up by including breakfasts. It’s a recent construction and it looks better and cleaner than many other Bagan budget options. Interiors are well maintained and clean, though the ground-floor shared bathroom and dorm are dingy and bathrooms could do with some renovation. New rooms are in a much better condition and still a very good deal, offering clean ensuite showers and efficient air-con. Decor is minimal and breakfasts are basic, but a friendly vibe infuses the place and at these prices you wouldn’t expect luxury. Winner is separated from the very good New Wave by a large air-con Thai restaurant -- and around $20 a room.